As a parent, your child’s safety is essential, particularly in your vehicle. Whether you have an infant or a toddler, you need a car seat that you can trust. A convertible car seat may be your best option, learn more about some the best-rated options. A car seat that you can trust is a “must have” for every family with infants or young children. Not only do car seats keep your children safer in the event of a car accident, but they are required by law. 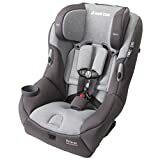 Shopping for car seats can often be an overwhelming experience, especially when there are so many available, and you might have a hard time deciding if you should get a convertible car seat or a standard infant seat. 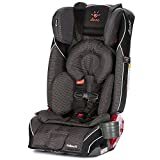 We will give you some tips about choosing a convertible car seat as well as our pick for the best convertible car seat and some other excellent options that you can trust. If you’re new to parenthood or are an expectant parent, you may have a lot of questions and will be experiencing many “firsts.” You know that a car seat is essential for your baby’s safety, but you might not know the difference between a standard infant seat and a convertible car seat. A traditional infant car seat is often a “bucket” style, is rear-facing only and locks into a base (which is buckled or latched into your vehicle). These types of seats have a handle, and it’s often convenient and easy to carry your infant in and out of the car without needing to unbuckle them. One significant downside of an infant seat is that there are height and weight limitations, which depending on the size of your infant, they may grow out of the seat quicker than you might expect. A convertible car seat is designed much as the name suggests. Many convertible car seats are suitable for infants (with proper infant inserts), and can continue using the seat through toddlerhood. Convertible seats can be rear or forward facing and some even have a booster option for young children who still require a car seat. While convertible seats are safe for infants, they are strongly recommended by the time an infant turns one year old. Rather than having two car seats, you may want to consider a convertible seat from the beginning and if not, definitely by the first birthday. 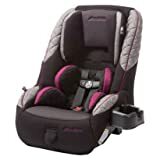 When you consider the aisles of car seats in every big box store and the dozens online, you might be wondering how we’re able to narrow down the selection can choose the best convertible car seat. We spend hours doing research reading online customer reviews and testimonials. We never add a product to our “best of” list until we’ve done adequate research. Not only do we pay close attention to the positive reviews, but we also read the negative comments to ensure that we provide you with a well-balanced review. After we gather all the information we need on each convertible car seat, we rate each one with a five-star rating system. Our top pick, which is the best convertible car seat, receives a full five-star rating; this means that it exceeds our expectations and it received overwhelmingly positive feedback from other reviewers. Even though we don’t give each convertible car seat a five-star rating, it doesn’t mean that they aren’t great options. We never recommend a car seat that we wouldn’t use for our own children. Now that you understand how our rating system works and you know the difference between a standard infant car seat and a convertible one, let’s take a look at our top choices for the best convertible car seats. We’ll share the specs, features, and some of the feedback from other users. We will finish up each mini-review with our own rating out of five stars. Keep in mind that even if a car seat on our list doesn’t have a five-star rating, it doesn’t mean that it’s not a good choice. The American Academy of Pediatrics strongly recommends that children remain rear-facing in their car seats until at least two years of age. Rear-facing is the safest option, even after your child is two years old, and if you’re like many parents, you may want them to stay rear-facing as long as they are comfortable. Graco is a well-known manufacturer of a variety of high-quality and affordable gear (from cribs and car seats to high chairs) for infants and toddlers. This convertible car seat has a four-position extension panel which is designed to give your child five-inches of extra leg room while rear-facing. The durability and weight capacity of this car seat also allows children to ride rear-facing until they weigh up to 50 pounds. With six different reclining positions and a ten-position headrest, you can adjust the seat to fit your child safely and comfortably as they grow. The Graco seat has a Simply Safe Adjust Harness System, a 5-point harness system, and quick installation with the LATCH attachment. 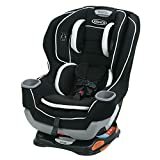 The car seat can accommodate rear-facing children up to 50 lbs, forward-facing children over two years old and up to 65 lbs, and children up to 49 inches tall. Other features include a harness strap storage and a cup holder. Users of this convertible car seat love the affordability and that it meets the US Standard FMVSS 213 crash test. Many users with smaller family cars were initially worried about installing a larger convertible car seat, but were happy with the results and thought there was enough space for their young child. Other users were happy with how easy it was to install and adjust. Some of the most critical feedback came from users who thought that the car seat was challenging to adjust and that it was difficult to clean. Britax is well-known for their top-rated car seats and this convertible seat holds up to the manufacturer’s quality and standards. With a 14-position harness and 2-position buckle, the car seat can be easily adjusted for comfort as your child transitions from front to rear-facing. There are also 7 reclining positions for comfort and to safely fit in a variety of vehicles. The convertible seat has a durable steel frame, an impact absorbing base, and side impact protection to keep your child as safe as possible. The car seat is designed to accommodate rear-facing children from 5 to 40 lbs and forward-facing from 20 to 65 lbs. Many users of the Britax car seat loved the ease of use and how confident they felt once it was installed in the vehicle. Some users had tried other brands, in addition to the Britax, and liked this model the best. Users who didn’t like this convertible car seat had issues with the installation or didn’t think it fit in their vehicle as comfortably as it should; others complained that it was difficult to clean. Many convertible car seats are designed with a weight capacity of around 60 or 65 lbs. One of the standout features of the Diono seat is that it has a weight capacity of up to 120 lbs. The steel frame, with aluminum sidewalls, and adequate padding and head support make this a safe design for infants and young children. There are 12 positions on the headrest and body support cushions for infants. Rear-facing capacity for the Diono convertible seat is 5 to 45 lbs while the front-facing capacity is 20 to 65 lbs. This convertible car seat can be converted into a booster seat, which is safe for children from 50 to 120 lbs. Safe for use in an airplane, the Diono folds flat for easy storage or when carrying around in an airport. 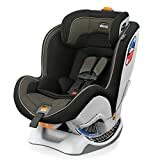 Some users, who reviewed the Diono, had been involved in an accident with their child and the car seat kept their child safe and free from injury. Most users like that it is the only car seat that they will need for one child, as it converts from an infant seat into a booster seat. Users who were unhappy with the seat thought the seat was too heavy, had difficulty with installation and found it difficult to clean. Others were worried about the seat being recalled in 2017 (other users had no issues). Chicco is another well-known manufacturer of infant car seats and booster seats. This convertible seat has nine different reclining positions and an adjustable headrest. This seat can be installed by using a LATCH or with the vehicles seat belt (which uses the LockSure belt-tightening system). Weight capacities for the Chicco convertible seat are 5 to 40 lbs for rear-facing and 22 to 65 lbs for forward-facing. Like other convertible car seats, the Chicco has a durable steel frame and energy-absorbing foam. This seat is also approved for use in an airplane. Most users who purchased the Chicco car seat were happy with the price, the durability, and the ease of installation. Some users mentioned that there was plenty of same left in the back seat for other passengers or another car seat. There were very few complaints about this seat, but the users who were unhappy with the seat didn’t like how it fit in their vehicle, the material that was used in the car seat or had installation issues. Eddie Bauer is well-known for many things from clothing to outdoor camping gear, but some people may be unaware that the company also manufactures top-rated car seats. This convertible car seat has a compact and simple design but is still designed to accommodate children up to 65 lbs (when facing forward). Rear-facing weight capacity is similar to other convertible seats and is between 5 and 40 lbs. Like the Diono, the Eddie Bauer’s sleek, yet comfortable, the design allows three car seats to sit side by side in the back seat (of most vehicles). Other features include an easy install LATCH option, a 5-point harness, and side impact protection. Many users of the Eddie Bauer seat like the compact design, the affordability, and that it’s durable and easy to install. Users with smaller vehicles like how well this car seat fits. The users who were not happy with the convertible seat weren’t confident in how well the seat was installed and they had issues with the seat “fitting” their child. The Maxi-COSI is a front and rear facing car seat, but unlike other 2-in-1 options, this one has higher weight capacities. For rear-facing, the seat is designed to handle lbs, and for forward-facing, it can handle 22 to 85 lbs. Features include a “perfect fit” harness and comfortable, washable cushions, and a one-click Latch system.